My husband and I step off the hydrofoil onto grey cobblestones, worn smooth and shiny. We are in a different land now – free of traffic noise, neon signs and the scurry of people needing to be somewhere other than right where they stand. With the sea at our backs, we gaze at rocky hills dotted with trees and square whitewashed stone buildings, topped with terracotta tiled roofs and adjacently stacked like legos. This is the island of Hydra, enveloped in the Aegean Sea and embracing a way of life very different from where we came from. The first item on our agenda, in a place that seems to ignore agendas, is to check in to our hotel. We meander through narrow, winding passageways that flow up from the harbor and seem to follow no particular organization – passing by simple markets displaying fresh, colorful fruits and veggies, intimate cafes open to the air, and doorways painted bright blues and greens, hinting to something wonderful behind them. After we check in to our hotel, we quickly get back outside to explore. We only have 24 hours until our departure and want to make the most of it. 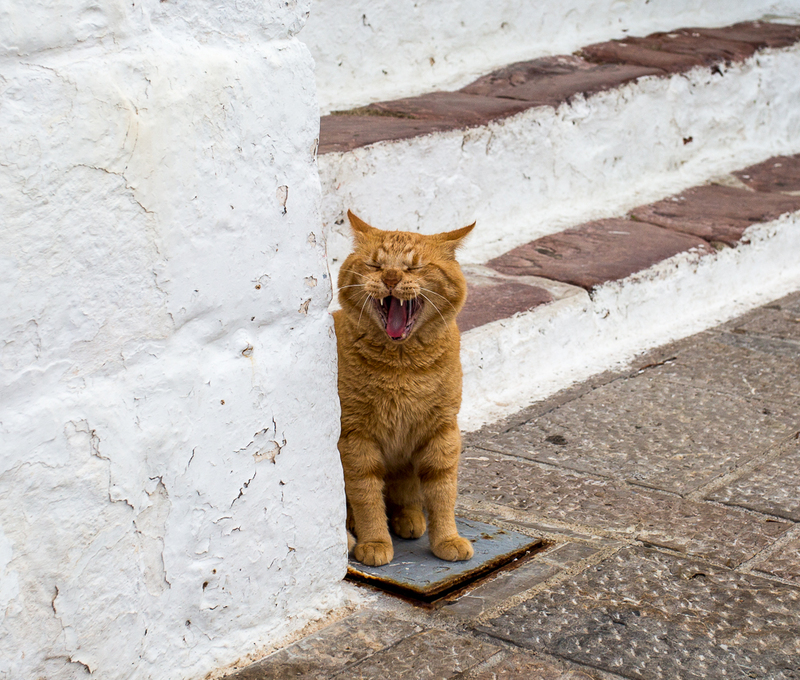 As we head back down towards the harbor, I begin to notice the cats. Cats everywhere – standing guard in doorways, lounging in patches of sunlight caught between rooftops, and meowing hello as people pass. Their friendliness is sweet and makes me want to take every one of them home with me. We make our way back to the harbor. It is late October and already beginning to get dark, so the town is illuminated under the warm glow of street lamps. We dip in and out of shops that line the harbor – selling beautiful clothes, jewelry, and artistic knick-knacks. The shopkeepers are so inviting – welcoming us to their store and their town, telling us a bit about growing up on this idyllic island. 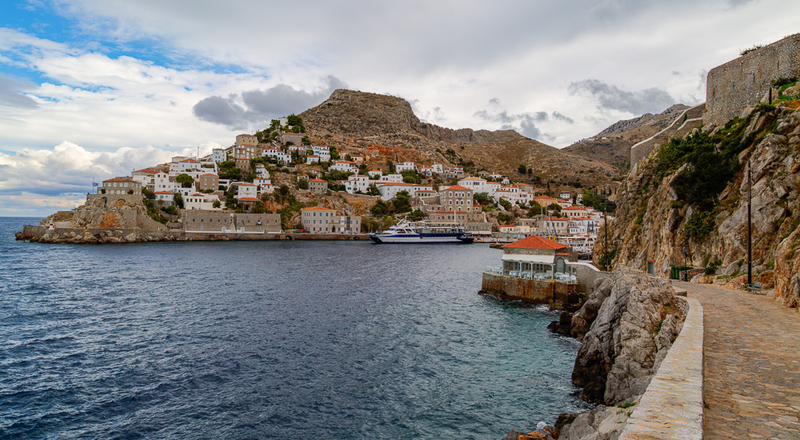 One man we meet was not born in Hydra and traveled extensively in his younger days – but has lived here for many years with no interest in living anywhere else. The next morning we are greeted with thick, bulbous clouds – allowing thin slivers of sunlight to shine upon the hills. We enjoy breakfast at a sidewalk cafe along the harbor as we watch a curious sight – a procession of donkeys being led off of a boat. 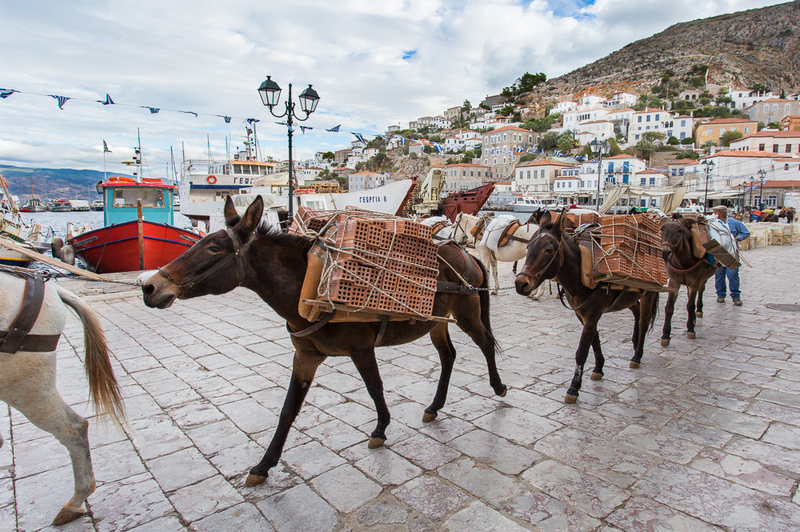 On this island, donkeys rule – no motorized transportation is allowed, so donkeys are used to move items or people. With plastic cartons filled with groceries or other items strapped on their backs, or with a human riding side-saddle, we see them throughout the day trekking through the tiny streets, their ears pointed upward and alert with a soulful look in the eyes and a calm demeanor. As the day moves forward, the clouds separate to reveal sky. We walk away from the harbor and follow the coastline for a while, gazing out over the water. We make our way inland, coming across a little courtyard. Here we linger for a while, chatting with a family from the US on holiday while we watch the antics of two young donkeys, about a dozen cats and several chickens – all co-existing harmoniously. 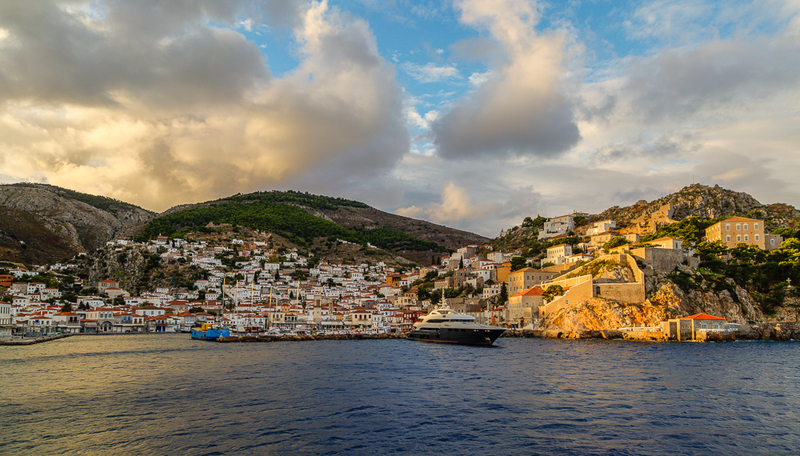 We head back to Hydra Town and enjoy a light lunch of red peppers stuffed with feta. A white and grey donkey is tied to a post outside of the cafe, with several tote bags attached to his saddle, waiting patiently with eyes half-closed. I am starting to feel a tinge of melancholy – knowing that soon the hydrofoil will be departing, with us on it, transporting us away from this blissful isle. Hydra feels like a step back in time. One can really unwind here and live moment by moment – viewing the boats as they go by, observing the donkeys making their daily trek from door to door, or giggling to yourself as you watch two cats sitting at someone’s feet while they eat their lunch, looking up at them and praying a food morsel will drop. 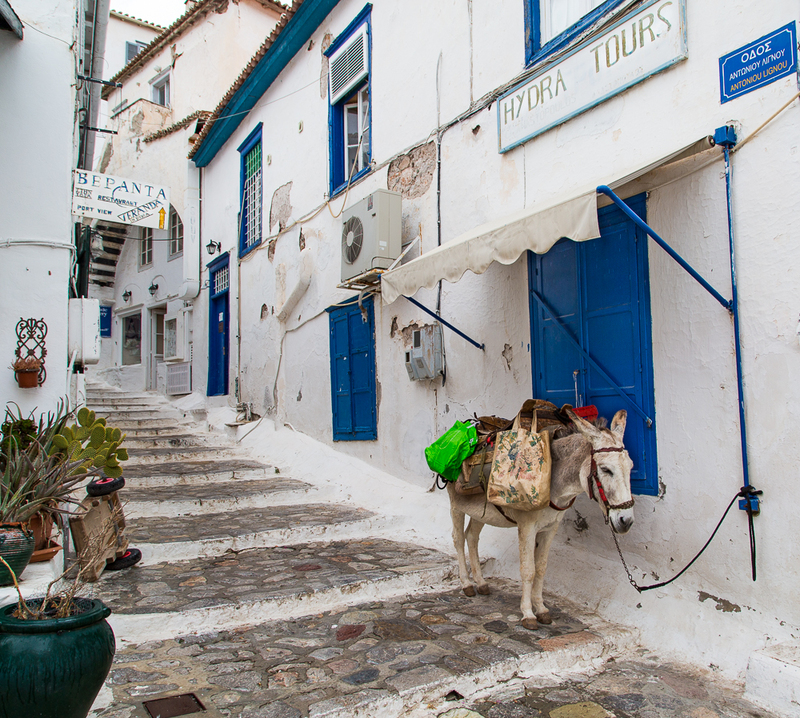 Here in Hydra, you can do as little as possible – and not feel a bit guilty about it.